Open Shifts or Open Scheduling puts your employees in control what shifts they can work on. 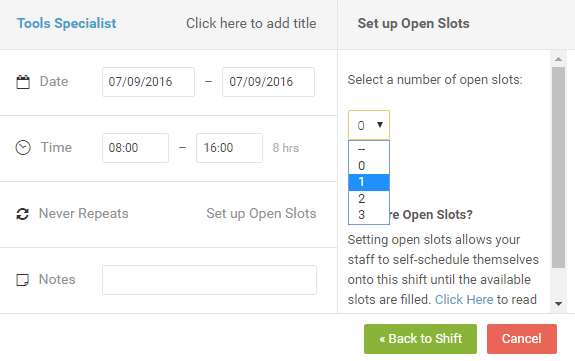 If you have an existing shift that you want to set as Open Shift, click the shift to set up Open Slots. Or create a new shift and open the shift edit window. In the mid-section of Shift Edit Window, there is an option Setup Open Slots. 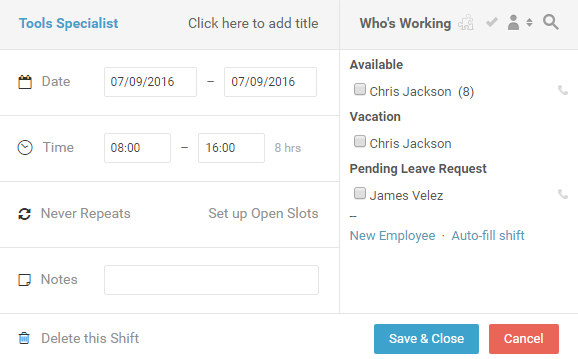 Click the Set Up Open Slots option and it will let you set the number of required employees on that shift. After you publish the Open Shifts, employees who are eligible to work that shift will be notified via email as well as a dashboard widget Shifts Available will appear on the account's Dashboard. Click the widget and app will show you the request section. Employees would need to click Request To Work to pick up a shift. After employee requests for an open Shifts, managers are notified via email as well as Dashboard widget Shifts Waiting Approval will appear. Click that to Approve or Reject the request. If manager finds the approval process time-consuming or want to give out the shifts on first come first serve basis, enable the auto open shift approval feature from the tab Settings > ShiftPlanning > Employee requests to pick-up open shifts are automatically approved.